Scotland is blessed with some of the most beautiful scenery of any country in the world. From the stark, brooding beauty of the Highlands, to the rolling, verdant hills of Perthshire, to the stunning misty islands of the West Coast. Luckily, there are many very good hotels and restaurants that take advantage of these natural wonders too. One of these is the Lake Hotel in the tiny Port of Menteith near Aberfoyle in Perthshire, the subject of the latest in our occasional series on restaurants with rooms. If there is a more glorious setting for a hotel than this I have yet to find it. 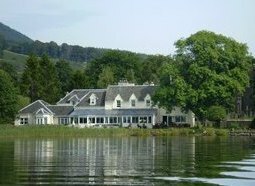 Sitting directly on the shores of Scotland’s only Lake (it was an 19th century cartographers mistake that changed it from being a ‘loch’), the hotel exploits it location within the Trossachs national park with a large conservatory dining room that touches the shoreline. In the distance, over the glassy waters of the lake, is the spiritual Isle of Inchmahome. A small ferry runs visitors back and forth to the Island with its ruined Augustinian priory which dates from 1238, and which once was the hiding place of Mary Queen of Scots. There are walking trails too. 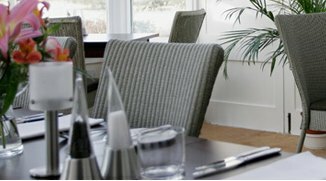 The Lake hotel dates from 1854, and is a much-extended former manse that now boasts 16 newly-refurbished and very comfortable bedrooms, a lively and welcoming bar, a whisky vault and the dining room. The hotel has been given a completely new lease of life since it was taken over by Glasgow restaurateur Ian Fleming in 2005. Fleming learned the hotel and restaurant trade in the USA and Scotland, and still travels regularly to the US East Coast where he does some consultancy. This has been his inspiration to refurbish the grand old building in a New England beach-house style, with pastel colours, stripped floors and lots of boating and fishing memorabilia. At first I felt this sat rather at odds with a Scottish Highland setting, but as Fleming says “I’m just tired of the Scottish country hotels that charged their guests a fortune for tartan carpets and stag’s heads.” I have watched the hotel and restaurant during its painstaking re-modelling, and having stayed there in summer 2008 as work nears completion, have to say the style has grown on me. It certainly makes for relaxing, bright and informal public spaces. Bedrooms are very comfortable indeed, with good beds made up with high-quality linens, soothing, plain fabrics enlivened by splashes of pattern and colour, and new bathrooms boasting copious hot water in power showers. Small touches like good Columbian coffee and cafetières, complimentary bottled water and flat-screen TV provide high levels of comfort. The hotel’s food didn’t always live up to the magical setting of the dining room. But Fleming is working hard in that respect too and has enlisted young chef Michael Hobbins to head up a team that delivered an excellent meal on my recent visit. Plenty of local, seasonal food was on display, with seafood from local waters, lamb form nearby hills and even Ayrshire potatoes from just down the coast. Taking lunch on a sunny day, or dinner as darkness falls, is pretty special in this setting. The wine list starts with Southern French house wines at £17.00, and has quite a few interesting bits and pieces as you climb through it. Domaine L’Arlot’s Nuits St Georges 1er Cru at £65.00 is pretty good value for example, though wine-pages readers should look out for a small selection of older vintages from a private cellar – 1970s clarets and the like – at very reasonable prices, though all sold ‘as is’. The Lake of Menteith is less than one hour from Glasgow or Edinburgh, and not far from the historic town of Stirling. Having had my reservations about recommending this beautiful but somewhat tired venue in the past, it is a complement to Fleming and his team that they have breathed new life and energy into the operation, and have done so with style.